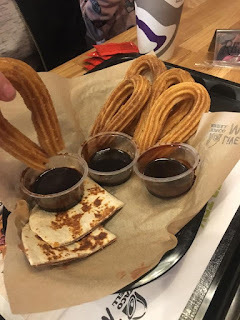 Mum of Five Staying Sane: Visiting Taco Bell UK's newest restaurant in Woking. With tacos, quesadillas and burritos galore as well as Happy Hour every day. We will definitely be back for another visit! Visiting Taco Bell UK's newest restaurant in Woking. 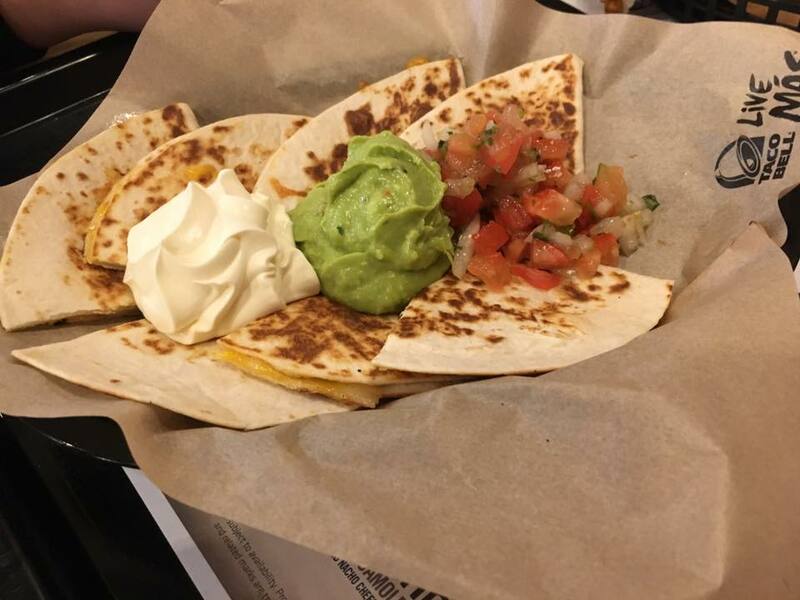 With tacos, quesadillas and burritos galore as well as Happy Hour every day. We will definitely be back for another visit! The Things have been wanting to go to Taco Bell for ages. 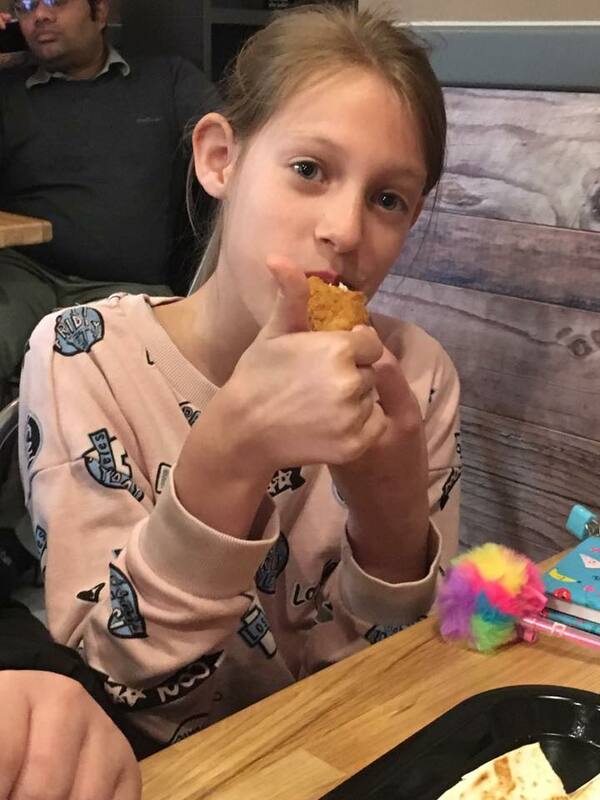 I think they are slightly influenced by the many US Youtubers that they watch and see them going to Taco Bell which is why it has become somewhere they have wanted to visit. I knew there were some Taco Bell restaurants in the UK but Thing 2 looked and found the nearest one to us was in Southampton, over an hours drive away. I told them it would have to be a specially planned trip out and quickly forgot all about it. Then at the end of August I found out that they had just opened a restaurant in Woking, a town not far from us and I knew we had to go and pay them a visit. I hadn't told the children that we were going there and luckily Thing 2 hadn't looked recently so she had no clue! So I told the children we were just popping to the shops in Woking as the younger ones wanted to go on a train ride anyway and it wasn't far to travel. When we get there the children were already saying they were hungry so it was a good thing I had food already planned! 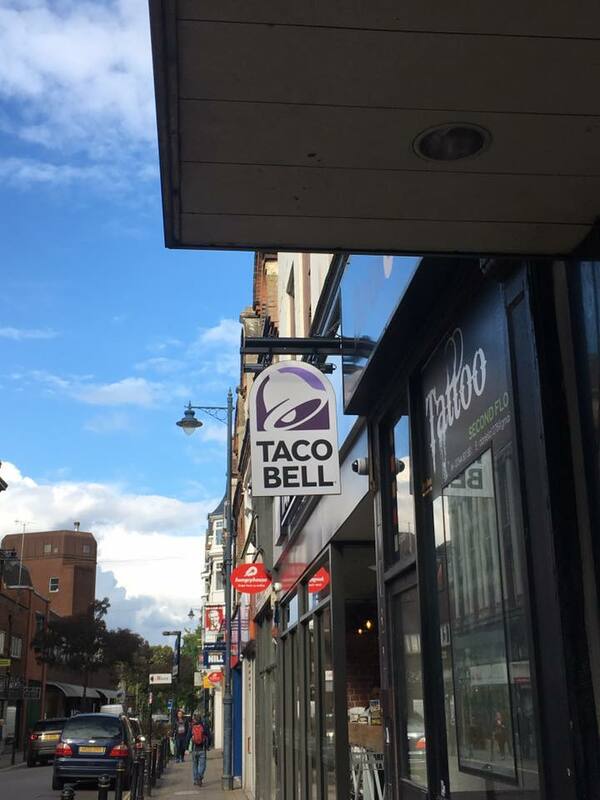 As we passed several other restaurants they kept asking if we could eat in those and I kept putting them off until they saw the Taco Bell sign and their faces lit up. I have never seen someone so excited over a restaurant before. When we arrived we were met by one of the staff members who helped us find a table. We were there to try out the Happy Hour menu which runs from 3-6pm every day (alongside their full main menu). 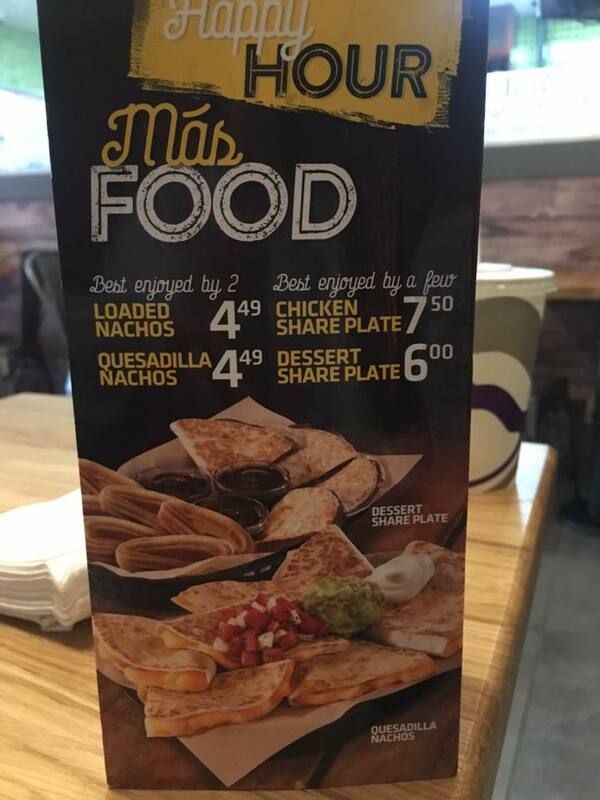 This includes items such as the chicken sharing platter, loaded nachos, quesadilla nachos and dessert platter too as well as offers on cervezas and the Freeze drinks. The restaurant has a very relaxed atmosphere. You find your table, choose your meal and then go to the counter to place your order. Once your order is ready they call out your order number to go and collect your food. 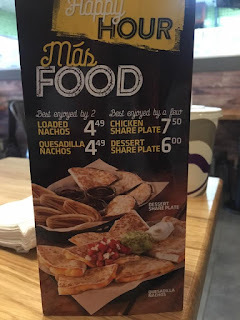 As I was there with the children, five of us in total, and each dish suggested a 2-3 person share option I went for the loaded nachos with chicken, the chicken platter and the quesadilla nachos for us all to share. 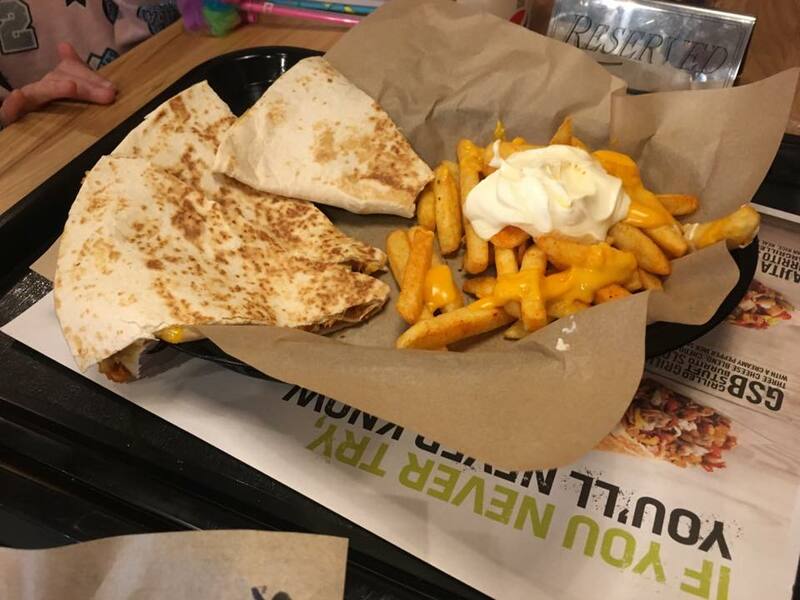 The chicken platter consisted of chicken fillet strips, chicken quesadillas and chips topped with a cheese sauce and sour cream. The loaded nachos came with a choice of topping and we chose the chicken. The food was lovely, the chicken platter was a real hit with the children and also the nachos with the chicken topping. The cheese quesadillas were also enjoyed by them although they weren't keen on all of the toppings (although Mummy loved it!). They wanted more chicken quesadillas to bring home too! The children really wanted the Freeze drinks which are on offer in happy hour at 2 for 3 pounds usually 1.99 each. However the Freeze machine wasn't working at that particular time so they settled for some fizzy drinks which wasn't a problem. The drinks machine was a help yourself machine and offered various drinks with a wide range of flavours to choose from too. After they had completely demolished all of the food and were all extremely happy with everything that they had eaten they somehow managed to find room for the dessert platter. Oh the dessert platter. I could have eaten it all by myself but unfortunately the menu advised sharing!! Churros are my favourite and Chocadilla too, wow. The children really enjoyed this platter too as did I. It was all lovely and warm, the churros were delicious and the Chocodillas were oozing with chocolate as Thing 4's trousers and t shirt found out! The dessert platter. There were lots more churros and Chocodillas on there when we got it! The children had full and happy tummies and I was so pleased that they had eaten everything that we ordered. 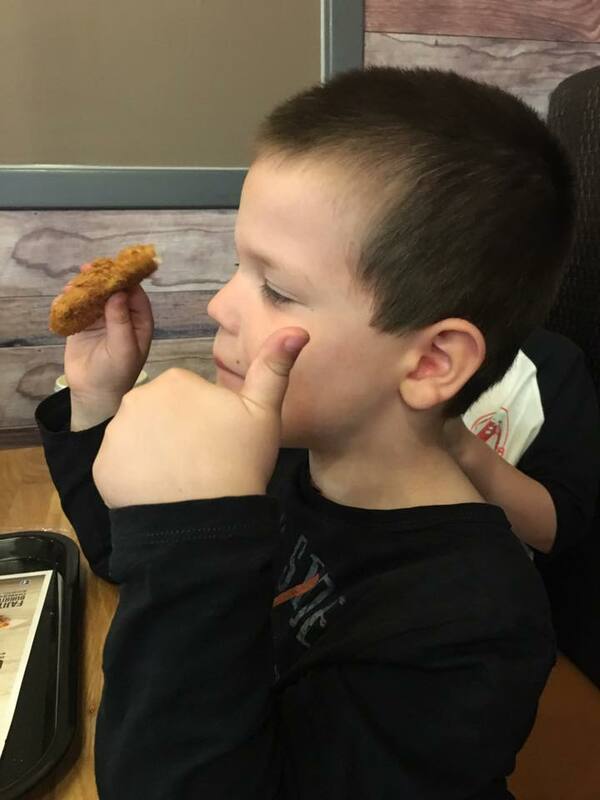 It's a thumbs up from Thing 5 and Thing 3! The staff were attentive and polite and answered any questions that I had, which I did have a few! The restaurant was busy but orders were dealt with swiftly and everyone in the restaurant looked to be enjoying their meals. With burritos and taco meals on the menu too we can try those on our next visit, which is very soon according to Dad of Five as he missed out on this visit! I would just like to thank Irina and her staff for being polite and welcoming during our visit and a special shout out to Mim who ran around after us and probably had enough of us by the time we left!! He was very helpful with everything and made sure we had everything we needed including our extra chicken quesadillas and churros to take home, even though we had eaten plenty in the restaurant. 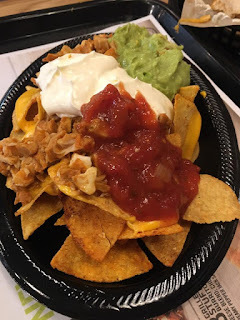 I would highly recommend Taco Bell as a place to eat either for lunch or dinner and it's great if you need a quick snack or a full meal to fill your belly. 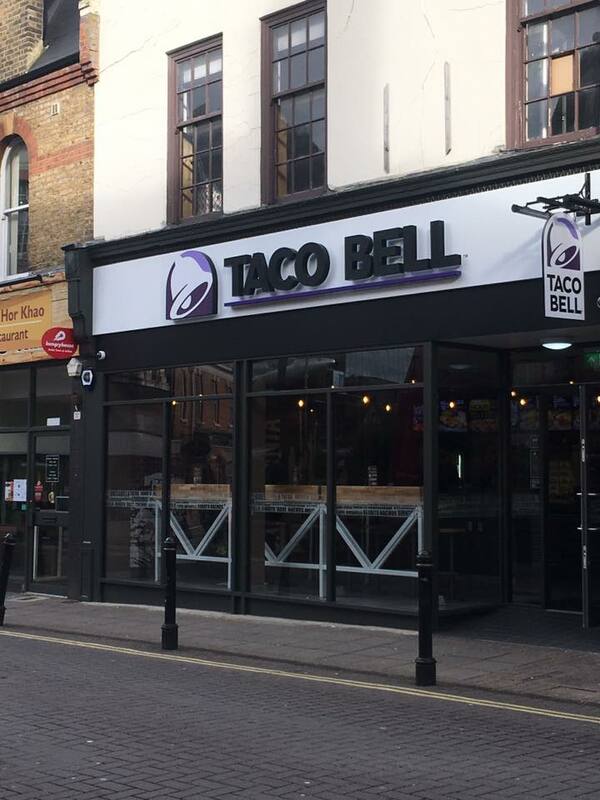 Do visit the Taco Bell UK website for full menu details and to see if there is a Taco Bell UK restaurant near you. Disclaimer; We were at the Taco Bell restaurant for review purposes and we ate as part of the review process. All comments and thoughts expressed are our own.